[dropcap]A[/dropcap]s you know, I like to see and test products for this page and the new award winning van lock for Abus was in my sights. But how do I test such a device, I have no van and certainly can’t fit it to my car. But the Abus team thought of a good idea – why not let me have it mounted on their new counter display? Brilliant! As the headline says it was awarded the DIY industries Gold award for 2011 – truly a great accolade. Based around their often copied and never beaten Diskus padlock, it comes with all fixings, fitting instructions and packing material to prevent paint damage. It allows a 6mm leeway for fitters to align and any future vehicle flexing. Its design has been based on thorough and extensive research into usage of vehicle security. 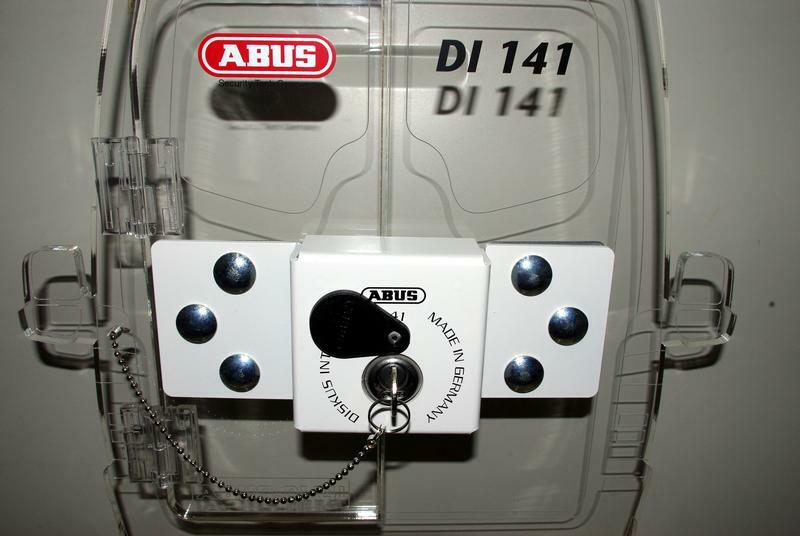 Abus have developed the Integral System which works single handed and utilises an anti-drill Diskus lock to secure a robust, steel white hasp and staple to the door. The padlock is set inside a 3mm folded steel, powder coated box that conceals the padlock and fittings, although once the door is opened it’s a quick job to swop out the padlock if there is a lost key. The version I tested is key retaining, less likely to leave it unlocked and can of course be keyed alike. One handed operation is handy (forgive the pun) so you can hold that parcel, toolbag or MPL and still secure the door. £46 RRP ex-vat for the complete system of cost effective, visible deterrent and top security. One of the major problems with mechanical security is to make it easy to use. Difficult to operate, retro-fitted, two handed door locks will not be used by drivers as it increases their call-time on which they are judged. So Abus’ van lock’s one handed operation makes it fast and simple to use, increasing it’s effectiveness in the field. I couldn’t attack the sample but the build quality is from a proven stable. It looks and feels good and the padlock at the heart of the system has defeated many a crook. The product has been branded ‘Integral’.